This isn’t the first show I’ve seen this season but it damn sure is the funniest. The revival of David Mamet’s A Life in the Theatre is still in previews. I’m not sure how the critics are going to treat it but I had a great time. Patrick Stewart is a pretty amazing actor. In addition to his big, fun paydays as Captain Picard and Professor Xavier (the same character, really), he’s an accomplished Shakespearean stage actor. I saw him a few years ago in London in Antony and Cleopatra, which was good, and two years ago as Macbeth in New York, which was great. I thought he was too old to play Macbeth but he pulled it off. Here, he plays an old windbag of an actor who has spent far too much time backstage and not enough time with civilians. Overly dramatic and sensitive to criticism, he takes himself and his craft far too seriously. His young colleague, played by T.R. Knight from Grey’s Anatomy, suffers his tantrums, hurt feelings and long, long, looooonng soliloquies about the theater and life, but develops a real affection for him. Some of the scenes are only a few lines long, but they’re perfectly placed little comedic bombs. 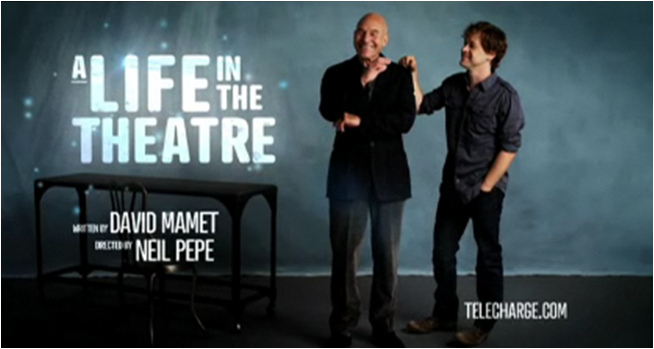 On the surface, Mamet seems to be making fun of actors. But the play is actually a love letter and a big wet kiss to the profession. It’s got a beautiful ending. As he walks off the stage, Patrick Stewart, in character, repeatedly, and with great hammy flourishes, wishes a good night to the imaginary audience he’s been playing to. Finally, just as he’s about to disappear into the wing, he turns to the audience, breaks character and quietly says, “Good night.” It’s an unexpected, effective fourth wall moment. Written in 1977, this is one of Mamet’s earliest plays. Do you know how Woody Alan’s early stuff is a lot funnier than his later stuff? That goes for Mamet, too. This entry was posted in The Play's the Thing by Exile on Pain Street. Bookmark the permalink. To think I missed this. Do you know how lucky you are to have all of that at your fingertips? Mind you, we did get to embrace Sir Ian McKellan in “Waiting for Godot” so perhaps we’re not the cultural backwater I sometimes think we are. Did you ever see Ronald Harwood’s ‘The Dresser’?This sounds as if it has elements in it – the old ham with his side kick the dresser with some hilarious moments as in getting enough thunder for ‘Lear’.I think Albert Finney was the ham and Tom Courtenay the dresser. Dahling! Another aab-solutely stunning review!Thankyou so very much. The pleasure is all ours.But you know that!…continued gushing…ad infinitum….Thanks! Dolce: If I had know you were interested I’d have hooked you up with tix during your visit. I read about that GODOT production. It was supposed to be pretty great. So, no, you haven’t much to complain about.Pat: I’ve heard about THE DRESSER but haven’t seen it. I love those backstage dramas. Dinah: There’s plenty more where that came from. You’ll see. i’m not particularly fond of plays about the theatre community, just like i’m not wild about films about making movies, or songs about the music industry… but you make this one sound a bit better than “chorus line”.oh, i make an exception for the mocumentaries “Spinal Tap”, “Waiting for Guffman” and “A Mighty Wind”. those make me giggle. a lot. sounds amazing! patrick stewart has been my favorite actor for a very long time (i have a soft spot for older, balding, british, shakespearean actors, must be in my genes…) i was lucky enough to see him in a one-man, one-act, one-time performance, “Uneasy Lies the Head”, at UNC when i was a student. he stood on stage for almost 2 hours and relayed anecdotes from his life and career, pausing to portray some of his most-loved characters and lines. utterly, breathtakingly brilliant. to see him switch so effortlessly in and out of dozens of characters, gave me the chills to watch, and still does to remember it.sorry for the book-long post.